Even in 1891, when Henry Ford went to work as an engineer for Alexander Dow at Edison Illuminating Co. in Detroit, electric power was still new and exciting. Initially, Detroit Edison supplied electricity for about 1,000 homes and 5,000 streetlights. As in today’s dawning age of mobility, the young industry attracted bright talents. Ford was 28 years old and had studied accounting and mechanical drawing before he went to work maintaining a steam generator on the night shift, all the while dreaming of horseless carriages. 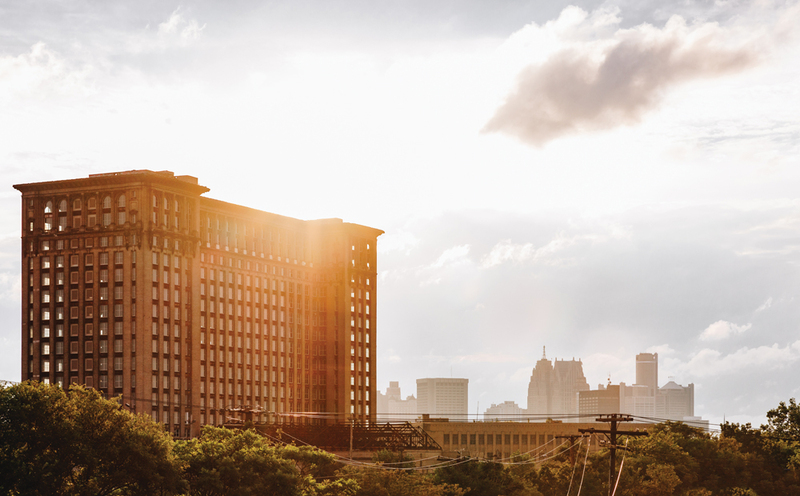 For an entire century, Ford Motor Co. had little presence in Detroit other than spearheading the development of the Renaissance Center as one of around 50 original investors. But that all changed last year when representatives of the company’s real estate division, Ford Land, began acquiring buildings and real estate parcels including a former hosiery factory, the Detroit Public Schools Book Depository (originally the Roosevelt Warehouse), an old brass works sitting on contaminated soil, and a small collection of neighboring parcels. 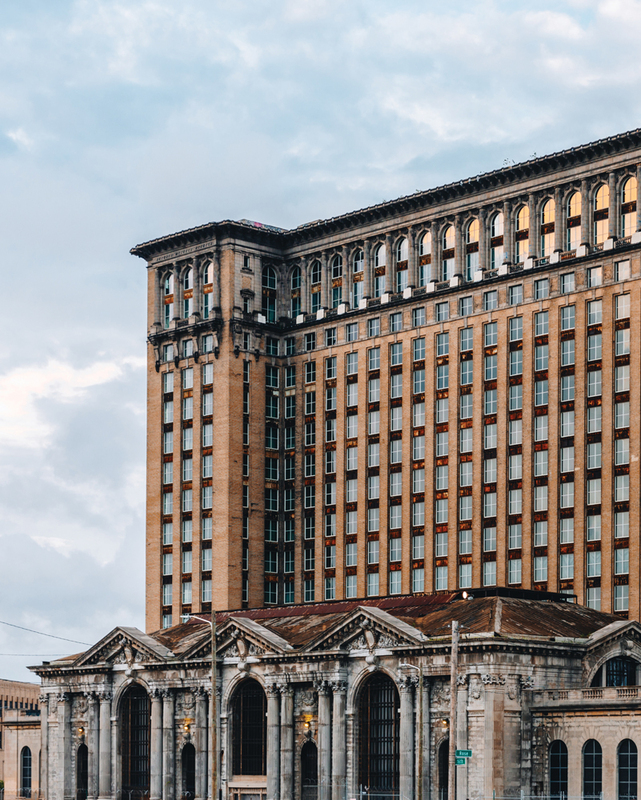 In June, Ford solidified its constellation by announcing its deal for Michigan Central Station, the abiding international emblem of derelict Detroit. “It’s time for Michigan Central Station to be restored and to remake this station into a place of possibility once again,” said Bill Ford, executive chairman of Ford and Henry Ford’s great-grandson, at the June 19 ceremony. The building will be restored to its glittering glory; in 2022 it will offer 313,000 square feet of office space, 40 residential units on the upper floors, and stores, restaurants, a coffee shop, and movie theaters and event space on the first floor. Like neurons pinging around in one’s brain, Ford’s campus in a constrained space in Corktown promises to sizzle with new ideas for mobility, connectivity, vehicle autonomy, and electrification. The engineers, programmers, and scientists who work there will attempt to integrate products and services with the Internet of Things, allowing automated devices to communicate. The vehicle, software, and features developed in the real-world Corktown test bed will capitalize on 5G cellular service to enable ever-more-massive data transmission. Ford’s budding R&D mobility campus in Detroit’s Corktown district is already underway with the recent opening of The Factory, just east of Michigan Central Station. Since June, the automaker has been meeting with key stakeholders and the general public to gain insight into what’s best for the district. In the future, autos will be more of a commodity than ever, car ownership by individuals will become less common, and automakers will enhance revenue by selling huge fleets to mobility providers. (Consider Fiat Chrysler Automobiles’ recent sale of 62,000 Chrysler Pacifica minivans to Waymo, the self-driving technology company.) Value-added services like ride-hailing and carsharing come into play, as well. 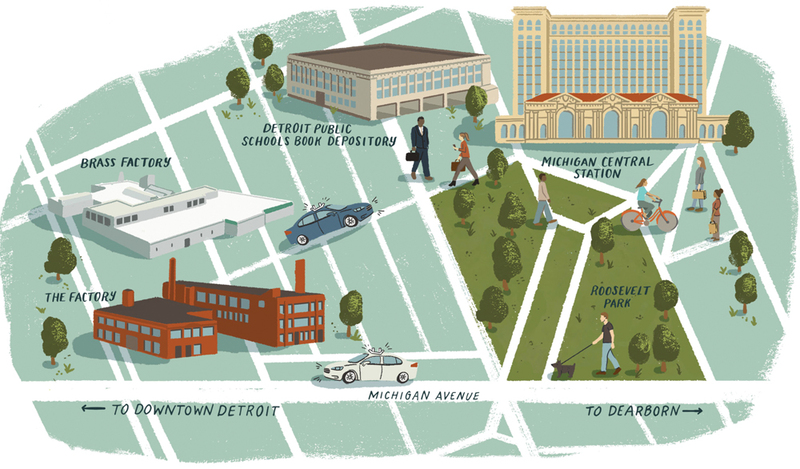 Before going any further, let’s take a look at the elements of Ford’s nascent Corktown campus. The plan is still being laid out for 1.2 million square feet of office, retail, and residential space. Within the next four years, some 2,500 Ford employees and 2,500 more workers from automotive suppliers and mobility-related businesses will work at the Corktown campus. Reports estimate development costs of more than $1 billion; the amount of goodwill Ford has earned by these moves could be worth more. Dave Dubensky, chairman and CEO of Ford Land, the automaker’s global real estate arm, says the $740-million Corktown campus will be the centerpiece of the company’s new self-driving business. 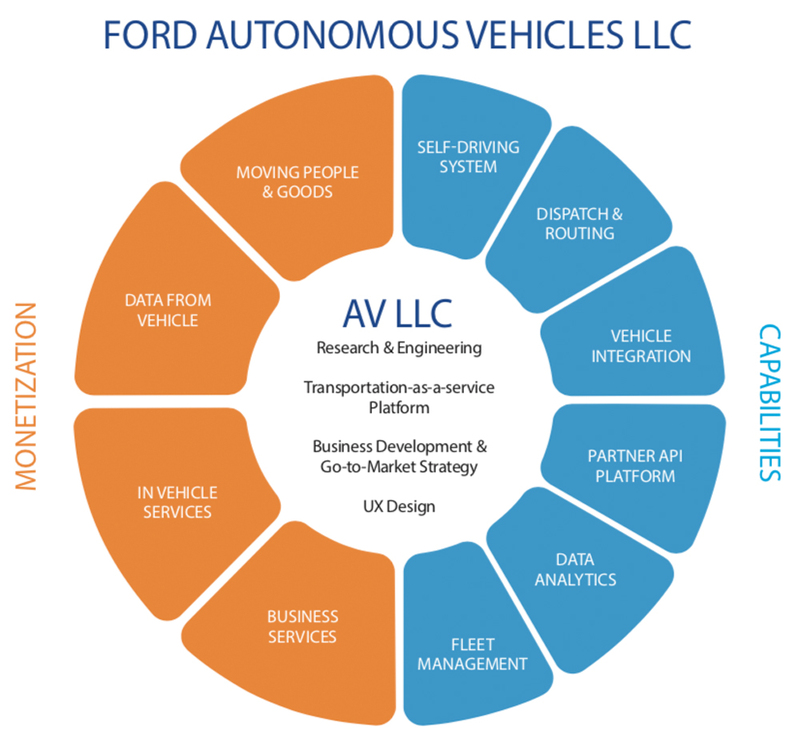 In late July, the automaker formed Ford Autonomous Vehicles, which includes its self-driving systems integration, autonomous vehicle research and advanced engineering, AV transportation-as-a-service network development, user experience, business strategy, and business development teams. The new company, which is structured to take on third-party investment, will hold Ford’s ownership stake in Argo AI, the company’s Pittsburgh-based partner for self-driving system development. Ford expects to invest $4 billion in its AV efforts through 2023, including its $1-billion investment in Argo AI. At the same time, Sherif Marakby, former vice president of autonomous vehicles and electrification, was appointed CEO of Ford Autonomous Vehicles. He reports to a new board of directors chaired by Marcy Klevorn, Ford’s executive vice president and president, mobility. Company officials say the closer alignment of the self-driving platform and the mobility solutions teams will allow for faster development of businesses that can thrive in the pre- and post-autonomous vehicle worlds. • The Factory, 1907 Michigan Ave., 45,000 square feet. Built 112 years ago, the light-industrial factory was constructed with a concrete floor at ground level. The second story, where the knitting equipment went in, had a wood floor. Chicago Hosiery Co. made garments here, while Detroit-Alaska Knitting Mills hummed away next door at 1927 Michigan Ave.
From a posting on the Corktown History blog, Paul Sewick quotes a contemporary Detroit Free Press article: “The factory is located in this district because of the fact that it has become known as a good location in which to secure labor of the class needed in light factory work.” But the factory couldn’t secure itself against the widening of Michigan Avenue in 1950; the building’s front 54 feet were torn away. In May, some 220 Ford employees in autonomous- and electric-vehicle strategy and planning groups moved in, including Team Edison, which is responsible for developing and bringing to market the automaker’s next-generation electric vehicles. • The Alchemy Building, located a few steps south of the Factory, at 2051 Rosa Parks Blvd., is an 87,000-square-foot structure that occupies more than 2 acres of land. The Alchemy Building housed Lincoln Brass Works, which made bullets during World War II, among other munitions. Later, Detrex Corp. — a producer of metalworking fluids and specialty chemicals — operated in the space. Most recently, after investors purchased the building in 2011, there was retail and office space, and then a preschool, which had to close because of fumes. Ford will demolish the Alchemy Building, remove 6 feet of contaminated soil, and put up a mixed-use, four-story building offering 247,500 square feet of office/lab space and 42,250 square feet of commercial space. • Detroit Public Schools Book Depository, northwest corner of 14th and Marantette streets. First known as the Roosevelt Warehouse, this handsome, well-proportioned edifice that some ascribe to Albert Kahn covers half the elongated block. It was originally a post office, but eventually became DPS’s warehouse for classroom supplies. A unique and desirable feature is its connection by a tunnel under the tracks to Michigan Central Station, where one could emerge into the depot’s vaulted, lavish, 76-foot-high lobby. Plans call for 205,000 square feet of office space and 20,000 square feet of commercial space. • Michigan Central Station, 2001 15th St. This monumental building, which cost $2.5 million to build, opened on Dec. 27, 1913. It could handle up to 9,000 passengers from 75 trains per day. The 230-foot-tall building ate up 7,000 tons of structural steel, about 125,000 cubic feet of stone, 1.5 million face bricks, and 7 million common bricks. Back then, space was stated differently: the station had 11 million cubic feet. Before closing the deal with Manuel and Matthew Moroun, principals of Warren-based CenTra Inc., which owned the station for 22 years, Ford conducted “an extensive evaluation process by architects, builders, structural engineers — people who understand what it takes,” Dubensky says. In July, Ford announced it was reorganizing its self-driving car efforts into Ford Autonomous Vehicles. Along with identifying capabilities and monetization, the automaker could draw outside investment such as the $2.5 billion General Motors Co.’s mobility efforts received from Japan’s SoftBank Group Corp. Watching the Ford announcement closely, Frank Venegas Jr., founder, chairman, and CEO of Ideal Group, a multifaceted construction, industrial, and commercial products firm in southwest Detroit that has more than 600 employees, says the automaker plans to bring 5,000 high-paying jobs to an area still rebounding from years of disinvestment. Venegas has never forgotten the trips with his grandfather to Western Market at 18th Street and Michigan, before the neighborhoods made a turn for the worse. Western Market, a sister to Eastern Market, got wiped out in 1965 by a freeway interchange. For decades, though, it was an anchor point in southwest Detroit. “It was a big place that sold everything,” Venegas says. “We used to go to the counter. There would be about five or six glasses of what looked like tomato juice.” His grandfather, who came from Mexico in 1917 and worked 41 years at the Rouge Plant in Dearborn, would select one of the glasses and crack an egg in it. “What it was, was bull’s blood,” Venegas says. In 1995, Venegas acquired part of the old Cadillac factory on Clark Street, south of Michigan Avenue, which had been shuttered for 11 years. Venegas recalls there were five gangs, low economic prospects, and 40-percent unemployment: “It was a rather miserable, dismal situation,” he recalls. But he saw how the neighborhood got a spark with what he and others invested in bringing the area back, and he expects the same from Ford’s move to Corktown. While Venegas helped create a lasting landscape, Ford will add its own brushwork. For example, Ford Smart Mobility, a subsidiary chaired by Jim Hackett, the automaker’s president and CEO, was launched in 2016. Its management has the stated intention of becoming a force in connectivity, mobility, autonomous vehicles, customer experience, and data and analytics. Today, connectivity means streaming music, in-car phone use, and unlocking doors with an app. In the future, vehicles will be connected to other vehicles as well as infrastructure like light poles embedded with sensors. Mobility, a hard term to define, includes everything from car-sharing to getting online help finding an empty parking spot. To help speed the technology along, last year Ford announced a $1-billion investment over five years in Argo AI, a tiny startup founded by Google and Uber alumni. The goal is to develop software for Ford’s first autonomous vehicle, coming by 2021, for broad commercial applications. The partners are also eyeing the licensing of the new technology. In 2022, Ford Motor Co. plans to reopen the former Michigan Central Station in Detroit’s Corktown district as a center for its mobility efforts, including 313,000 square feet of office space, around 40 residential units on the upper floors, and a mixture of stores, restaurants, coffee shops, and movie theatrs and event space on the grand lobby level. The movie theater will likely be operated in a partnership between Emagine Entertainment Inc. in Troy and Detroit rapper Sean Anderson, aka Big Sean. Argo has offices in Dearborn, Silicon Valley, and Pittsburgh. The latter, the company’s spiritual home, brims with talent from Carnegie-Mellon University and the University of Pittsburgh. In June, Ford rolled out its participation in the Pittsburgh City of Tomorrow Challenge, an attempt to create new mobility solutions in the City of Bridges through crowdsourcing. Ford will give $100,000 to fund pilot programs. Jessica Robinson, director of city solutions for Ford Smart Mobility, explained the automaker’s vision in a recent video: “At the end of the day, I think it’s a question of systems. It’s not about a car, or a bus, or a bike. Mobility is really all of those pieces working together in a city to help people get around,” she said. Early in 2018, Ford Smart Mobility added a pair of specialists in deals, provoking Business Insider’s headline: “Ford has just acquired 2 startups that have nothing to do with cars as we know them.” The acquisitions include Autonomic, a cloud-based digital platform for managing transportation systems in Palo Alto, Calif., and TransLoc, of Durham, N.C., which focuses on streamlining urban transit. Seldom do we find such acclaim for a corporation’s strategic moves. It’s almost as if Ford had just stormed the beach at Normandy. 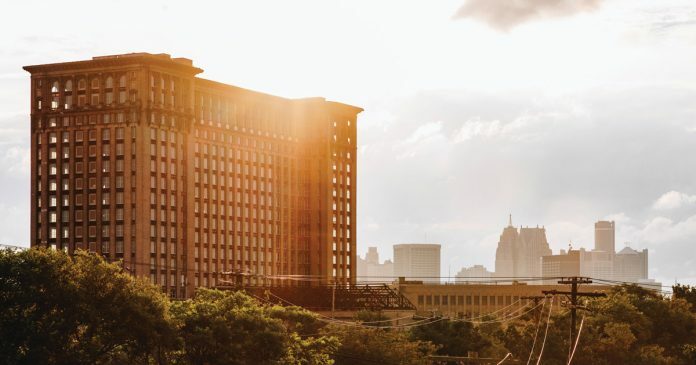 Bricks and mortar, the promise of gourmet coffee shops, eateries, retail, and a movie theater in Michigan Central Station, and the prospect of glitz — these command public attention far better than cloud-based semianonymous startups focusing on vehicle autonomy and micro-transit solutions. Will it really work? And why? “From a real estate perspective, it’s a beautiful old building we’re going to bring back,” Dubensky says of the station. “Wonderful talent” will be attracted to the campus, and the buildings will comport with the community after neighbors’ needs are understood. “When you have employees inventing the future of mobility, it’s going to be a great thing,” he adds. Or we can consider the vision of Dan Irvin. Seasoned by his years as founder and CEO of 123Net Inc., a large data storage and networking services provider in Southfield that runs and manages hundreds of miles of high-speed fiber across Michigan, Irvin is a keen observer of the Detroit scene, and his crystal ball presents images ranging from today’s potholes to a sparkling future pervaded by sangfroid. He envisions small 5G transmission devices, some a little larger than a round dinner tray, set atop buildings and utility poles to create a high-speed network. For the system to work, dozens of devices are needed in a given area, which eliminates the need for huge transmission towers. Connected vehicles will use them to communicate with one another and with whatever infrastructure endures through the changes ahead. Under that scenario, the era of six-lane roads, two-way streets, and 700-horsepower cars may slowly fade away, replaced by robot vehicles that will deliver groceries and take-out, provide mobile medical clinics and retail offerings in neighborhoods, and all but eliminate stoplights. Mobility is an almost limitless field for experimentation and the refinement of existing and new technologies. Here’s a look at Ford’s key mobility initiatives. 2. Mobility: Ford’s GoDrive program, which has been tried in London, lets a city dweller use a smartphone to book time with a Ford vehicle, pick it up from a hub for shopping and errands, and return it to that or any other hub. The driver pays only for what power is used. 3. Autonomous vehicles: As a keystone to its mobility program, Ford intends to mass-produce a Level 4 high automation vehicle — a fully self-driving car — by 2021. In this pursuit, it has struck deals with companies that will help with the rollout. Last October, after having already invested $75 million in Velodyne, Ford’s Argo AI unit acquired Princeton Lightwave, another specialist in LIDAR (laser detection) tech. By next year, Ford intends to have 90 cars with blinking rooftop arrays testing in California, Arizona, and Michigan. 4. Customer experience: FordPass SmartLink, available to everybody who owns a vehicle from model years 2010 to 2017, adds connectivity features to older cars. It’s just one aspect of Ford’s attempt to streamline and enhance the customer experience. Parking services and carsharing are part of the overall package. Loyalty benefits add further enticement. Other features include smartphone control of locking and unlocking doors and trunks, vehicle health reports, vehicle location tracking, and onboard Verizon 4G LTE Wi-Fi. 5. Big Data analysis: Similar to stock-market trading or energy-grid management programs, Ford’s Big Data efforts uncover patterns in real-time traffic and parking to reroute the traveler or predict the opening of a parking space. The Dynamic Shuttle pilot program on the Dearborn campus provides an ongoing test bed. Ford also is working with Vanderbilt University to launch an adaptive cruise control system called Co-Pilot360, where connected vehicles receive messages with the goal of reducing stop-and-go traffic. This program adapts Ford cars and trucks to accommodate wheelchair-bound passengers, disabled drivers, and people who need to carry along electric scooters and other medical-related equipment. The automaker helps persons with disabilities and those who care for them in selecting, financing, and adapting a car, van, or truck. The offerings include hand controls, lifts, parking brakes, ramps, hand- steering devices, carriers, power assist seats, alert hearing devices, running boards, lumbar support, and wheelchair restraints. As a key partner in Ford’s quest for self-driving vehicles, Argo AI aids in developing a virtual driver system. The quest encompasses steps in robotics and artificial intelligence. Argo CEO and co-founder Bryan Salesky’s background stems from the DARPA Urban Challenge, extends through self-driving mining trucks to Google’s self-driving car team, and finally to the launch of Argo in 2016. The company’s headquarters are in Pittsburgh, while engineering centers are in Dearborn, Silicon Valley, and New Jersey.